The image is a Laser Print of an original pen and ink drawing on coquille paper, producing halftone effects. It is printed with archival ink on heavy-duty matte paper. The image is 8 x 5 inches and comes in a 12 x 9 inch museum quality (acid free) mat board, backed by foamcore and shrink-wrapped for protection. 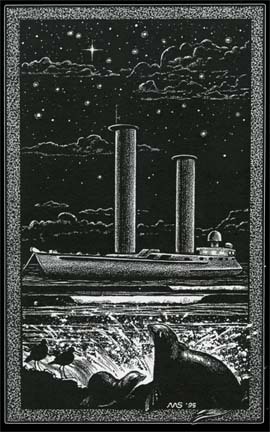 This is another black and white illustration that I did for Steve Arrington’s book series called “High on Adventure.” Here is Alcyone in the Channel Islands, anchored under a star-studded sky.